The above words on the front cover of this thriller by Simon Kernick were enough to make me pick up this book and take a closer look. It certainly sounded promising enough, so I began to read. Tyler wakes up one morning and finds himself in a strange room on a strange bed. He hasn’t a clue where he is or how he got there. The only thing that isn’t strange to him is his girlfriend lying next to him. The only problem is, the bed is covered in blood and his girlfriend is dead. What is confusing, as well as sickening, is his discovery that she has been decapitated and her head is missing. Stumbling out of bed, Tyler notices a TV and DVD player in the corner of the room, with a cardboard sign telling him to “press Play”. Tyler is horrified to see himself on the film killing his girlfriend as she lies tied to the bed. He then realises that it is not actually him on the film carrying out the killing, but someone cleverly disguised to look like him, complete with identical distinguishing marks on his body, but wearing a fetish mask. Tyler receives instructions to deliver a briefcase to a London address. If he carries this out successfully, he is told all evidence will be destroyed that will otherwise link him to the murder of his girlfriend. Tyler has clearly been set up. But by who? And why? Over the next 24 hours, Tyler is going to find out the answers to those two questions. 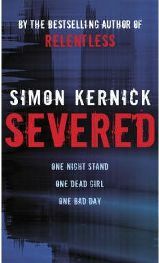 ‘Severed’ certainly promised to be a good thriller. The story takes place in London, over 24 hours and the action is pretty much non- stop from the first page. The good thing about this was I was quickly drawn into the story right from the first page, which is something I personally find appealing when beginning to read a book. If by the end of the first couple of chapters I am not becoming absorbed in the story, then my interest starts to dwindle away and it becomes a struggle to read any further. The story begins with Tyler waking up to his horrifying discovery and from then on this really is a rollercoaster of a read as Tyler sets out not only to obey the instructions given to him, but also to try and uncover exactly why he has been chosen to do this and who is responsible for the brutal murder of his girlfriend. The writing style is fast paced and it is certainly an exciting book to read. Indeed I found myself racing through the pages as events unfolded. It quickly becomes clear that there is a lot more to this than meets the eye and Tyler not only has to confront a few people from his past but also has to face up to a few home truths about himself. Nobody is who or what they seem to be, or at least that is how it appears to be. I found myself becoming suspicious of every character in the book, from Tyler himself to his girlfriend and friends. It makes for an engaging read. Speaking of characters, apart from Tyler, we are introduced to a few people from his past as he served in the Army, taking part in the conflicts of Northern Ireland, Bosnia, the first Gulf War and Afghanistan. Kernick doesn’t spend much time on character description apart from the main character of Tyler. Even then, we don’t get to know much about him, which I think is what adds to the suspense and not knowing if anyone can be trusted. There are some flashbacks to his time as a soldier which provide an insight into how he came to know certain characters in the story. This made for interesting reading as you realise there is a bond that serving soldiers share and how years later in civilian life, that bond remains. Or does it? Tyler certainly likes to think so, but it seems that some people don’t exactly share his feelings. There is also a character referred to simply as ‘The Vampire’, a silent and lethal killer who is feared throughout. Although referred to at various points throughout the book, I did begin to wonder if The Vampire actually existed or not. That’s the good thing about this book : it keeps you guessing! The story has quite a few twists, including one quite big one and the suspense remains throughout, which again makes for exciting reading. The only problem I had was that some of it seemed a little far fetched. It was a little like watching one of those action hero films where the hero comes through scrape after scrape whilst hurtling from one life-threatening situation to another. This is certainly the case with Tyler. I did think on more than one occasion whilst reading that he should be dead or seriously wounded. I also found I had to remind myself several times that it was still the same day! There are so many situations and the pace seems so fast that it feels like a few days have elapsed. I found I was struggling to comprehend how so much could take place all in one day. Nothing spoiled my enjoyment of reading this book however, even if it did seem unbelievable at times. I do enjoy a thriller with a few twists and this was the main advantage of the book for me, as I had no idea what would happen next and did not realise who was behind it all until near the end. One thing that puzzled me however, is the blurb on the front of the book which I mentioned at the beginning. As it states, “One night stand… one dead girl…” What puzzled me is there is no “one night stand” if you take it to mean that they are referring to Tyler’s girlfriend as they are in a relationship, so it is no one night stand! Another thing I noticed was that it states on the back of the book : ” The phone rings, and a voice tells you to press play on the room’s DVD machine”. Again this is inaccurate as there is no phone call whilst Tyler is in the bedroom. He is directed to press play by a cardboard sign placed upon the DVD player! Of course these are minor gripes, but I think as the blurb on a book is often the major factor in your decision to read it, at least it should contain accurate information. If you enjoy a good thriller with plenty of twists then I can recommend this book, even if it is a little far-fetched, it is pure escapism. I found this book very easy to read and the story flowed well from start to finish.